Pre-heat the oven to 180 degrees. Mix the herbs etc into the dry almond meal. Add the water slowly to the almond meal to make a stiff dough. Roll the dough thinly between 2 sheets of baking paper – 1-2mm is ideal. Peel off the top sheet and score the dough with a knife (like a criss cross to make square that snap off when the crackers are baked). 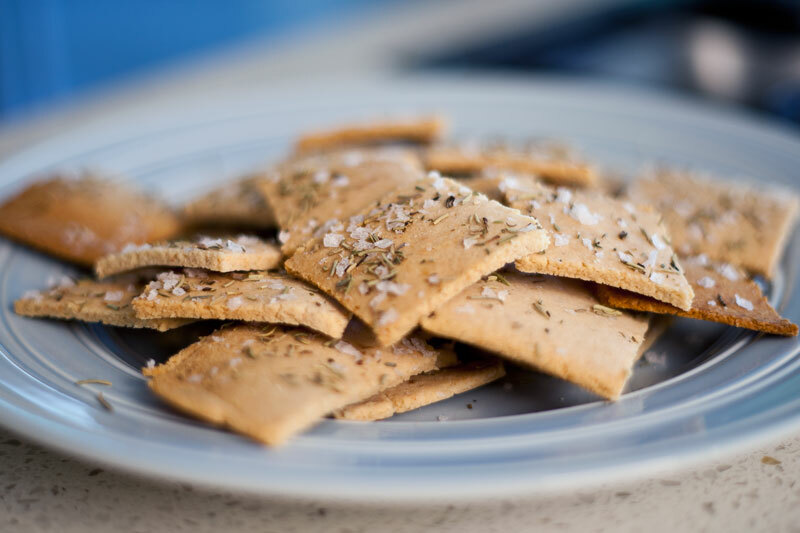 Bake for 25-30 minutes on a baking tray until the almond crackers are golden and crisp. They are one of the richest food sources of vitamin E (for skin, hormone and cardiovascular health, and an antioxidant that is crucial to cancer prevention). They are rich in protein, containing about 20g per cup (the same as a small piece of steak or an average fillet of fish). Most people need around 20g of protein per meal (that is, 3 times daily) to meet their daily protein requirements. So – while a cup of almonds might be overkill as a meal (imagining the jaw cramps), a decent handful in cereal or a trail mix will provide quite a rich top up. They are very low in carbohydrate – half a cup contains about 3g of carbs, which is about the same as a bite of fruit (most fruit being approx 20g carbs per piece). This makes them excellent food for both low glycaemic and low carb weight loss diets, as they barely elicit any insulin response at all from the pancreas. Insulin is one of our strongest fat storage hormones, and excessive release over time can lead to diabetes type 2. For many of us, it’s best to let that sleeping dog of a pancreas lie. They are rich in fibre, which nourishes the bowel and helps to put the (body’s) garbage out. If only it would take my bins out on a Tuesday morning as well. Check out the Almond Crackers Recipe video. I made these in no time and served with the herb dip! It didn’t last long. Loving all of these recipes and knowing how the incidents benefit the body.